We Provide bathtub refinishing, resurfacing, and other bathroom or kitchen surfaces Restoration and Repairs. Our refinishing employees had been trained with different surfaces using the best process to refinish and repair your Vanity, bathtub, tile, sink, making it look new without replacing. 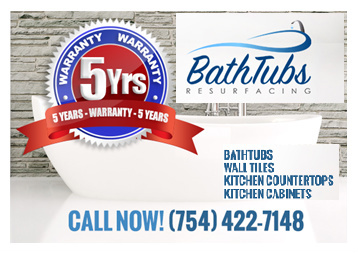 At Tubs and Tops South Florida is our goal to provide the best service to every Residential and Commercial Customers.